Your front door should be a welcoming and attractive entrance to your home, while also providing strength and security to protect what matters most. Asgard Windows recommends Composite Doors – the industry standard for security, efficiency, durability and beauty. 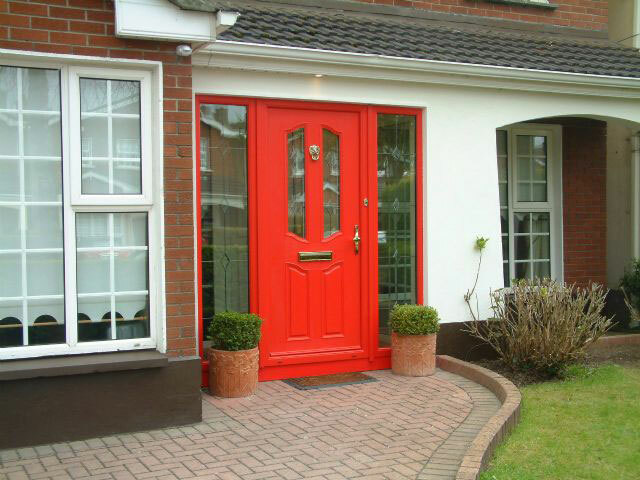 We offer Ireland’s most popular composite door ranges – Apeer and Palladio. The Apeer series includes the elegant Modo and Diamond ranges, and we have a complete selection to suit all needs. The Palladio Collection features sixteen stunning designs molded from a real oak pattern, designed with security and beauty in mind. Asgard Windows’ showroom is based in Dublin 15 and we supply composite doors all over Dublin and the surrounding areas. Contact Us for a quote today! Composite doors are the latest in robust and secure door technology, offering ideal protection as the main entrance to your home. These doors are growing more popular as homeowners recognise that a front door can be strong and secure, while not compromising on elegance and style. The word ‘composite’ comes from the Latin compositus, which means “well-arranged”. The doors consist of a mix of carefully chosen materials – GRP (glass-reinforced plastic), a high-density polyurethane core, and uPVC with steel reinforcement. These elements ensure your composite door is the last word in safety, security, beauty and insulation. Have a look at our Video Gallery to see the attractions of our composite doors for yourself. Many people like the look and feel of traditional timber doors, but unfortunately they have their drawbacks. Timber doors can suffer from wear and tear; they can bend with age and lose their initial attractive look. Also, they may not provide the best insulation, and they may not stand up well to force. You need a front door that’s stronger and more robust, and maintains its appearance year after year. With a composite door you have the best of both worlds – all the charm of a traditional timber-effect finish, but with the many features and benefits of expert construction and installation. Composite doors are a lot tougher than traditional doors and have a much longer lifespan, with weather-resistant and insulation qualities. They will not warp, fade or perish, and you don’t need to do anything to maintain them – just an occasional clean down with a cloth. No annual staining or polishing! One of our most popular doors is the Apeer70, which offers the key ‘double-rebate’ feature. The double-rebate system allows a tighter-fit, which means that the door is fully sealed and gives complete protection against draughts, water and weather. It can also withstand more movement than single-rebate, so your active household (and therefore busy doorway!) will gain from the stronger option. Our attractive Palladio doors are designed with a ‘monocoque’ structure, which gives them a huge strength-to-weight ratio and is protected by patent in Europe. One of the main attractions of a composite door is its energy efficiency. With high thermal resistance, our doors are designed to keep the heat in and the cold out. These doors were initially developed with Northern climates in mind, so their insulation ability is second to none. Tests show that they can reduce energy loss by as much as 85% compared to traditional timber doors! A composite door can even be Energy-Rated, much like your washing machine or fridge. For example, all the Apeer70 doors that we offer can be specified to achieve the maximum ‘A’ rating. This is due to the materials used in manufacture – the fibreglass (GRP), the high-density polyurethane core and the draught-excluding double-rebate. These benefits can ultimately save you money on heating bills! Also, the doors are the best on the market for kindness to the environment - all the elements are recyclable, the polyurethane foam is CFC-free, and there is no timber used in construction. So not only are they good for your pocket, they also help to reduce your carbon footprint! There is a wide selection of styles and colours available for composite doors. The Apeer range – particularly the Diamond and Modo series – is carefully designed to offer the customer the best in elegance and taste, while not compromising on strength and security. Our manufacturers can colour-match to any RAL or BS reference, which gives you great flexibility in deciding on the appearance of your complete door area, inside and outside. Colour choices are not restricted to white frames, or to a white-only finish on the inside. You can choose your door colour and custom-match the frames, the rebate, the interior and even the edges. It is also possible to achieve the attractive wood-grain appearance on a composite door – a very popular feature which gives it a ‘traditional’ feel while still maintaining consistency in finish. The low-maintenance but highly robust materials help the door to stay looking good, year after year. You may also choose to install decorative windows around or above your front door – these are known as sidelights or top-lights. With Apeer, all of the bevelled glass designs are hand crafted by decorative glass experts, and can be double or triple-glazed to offer you maximum protection and insulation. The glazed units are carefully integrated into the door so that they can only be accessed from the inside, which makes redecorations or replacements easy, and also enhances the security features of your door. The Palladio collection offers triple-glazed glass styles which can be combined into the door scheme. The team have also designed and manufactured a hinge exclusively for their doors, so that it is visually concealed. And the appeal of a real oak door is maintained in the deep-grain finish, which gives all the beauty but none of the drawbacks associated with wood. And of course there’s the most important factor – security. When it comes to the main entrance of your home, it must be as strong and secure as possible. The Apeer composite doors have ‘Secured by Design’ police approval, and are proven to be able to withstand a higher level of force than traditional timber doors. The ‘monocoque’ structure used in the Palladio design can resist huge weight in contrast to its strength, even the load of a 4x4 vehicle! Using a unique combination of some of the strongest and most robust materials in the world, coupled with our expert fitting and installation, our composite doors have security at their very core and will protect what matters most – your family and your home. Check out our Video Gallery for the extraordinary security tests performed on the Apeer and Palladio composite doors. You’ll be amazed!